For as long as I can recall, my mother would bake our bread each week. Three loaves and half a dozen rolls. It was bliss! Obviously freshly baked bread is divine but there was something about the crust of her bread which was just amazing. We must have been the only children I know of begging for the crust ends. Even my father would notoriously remove the end of the loaves, leaving my poor mother to find every loaf without a crust! 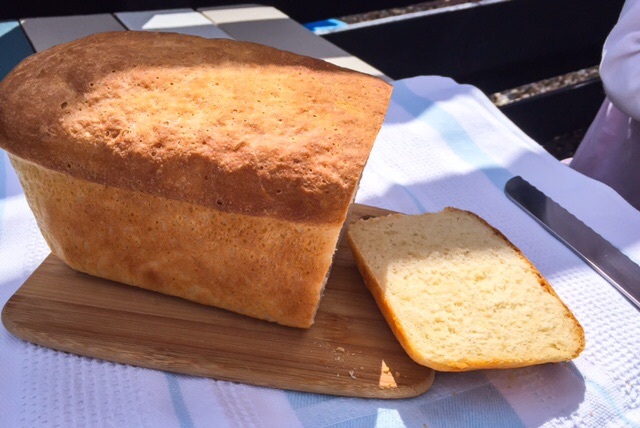 I am always surprised to find how few people I know have tried their hand at making bread – not including a bread maker. It is far superior to the loaves you buy at the supermarket and really doesn’t take as long as you might think. The smell of freshly baked bread alone should motivate you, otherwise the kneading can be quite the gratifying process where you can work out some tension! Honestly, it isn’t as time-consuming as one might think. You need only plan your time to allow for the steps to happen at the right time. I allow myself three hours where I need to be at home and where I can do other things whilst I wait for each rise and the bake to complete. It is really only the first stage where the work is put in. After that you are waiting for an hour, punching and reshaping for only a few minutes, then waiting another hour, throwing in the oven and waiting again for half an hour. Easy! I used to make my mother’s bread recipe all the time. Then I moved around, and around again, and somewhere along the way my scrawled recipe got put into a box and wasn’t to be found again for ages! When I started having kids, I really wanted to be in control of what they ate so I started to make bread again. I would buy 16 kilogram bags of flour (yes, that much!!) and each week I would make a couple of loaves. I tried many different recipes. Some I loved more than others. Lightly dust a clean work surface with flour and turn out the dough on top. Begin kneading the dough until it the texture changes and you have a nice springy, elastic dough which is slightly sticky on the outside. This should take about 10 minutes. You will need to keep adding flour to your surface as you work but you will find once the dough has been kneaded that you will need less and less as you work it. Wash the bowl you were using to mix everything together in hot water and dry it with a clean towel. Lightly grease it with butter, non-dairy spread or vegetable oil. Place the dough in the bowl and use a little more butter/spread/oil to very lightly grease the surface. Then cover the bowl with a clean towel and set aside in a warm place free from drafts. I also find covering with cling film will help ensure this process goes as quickly as possible. 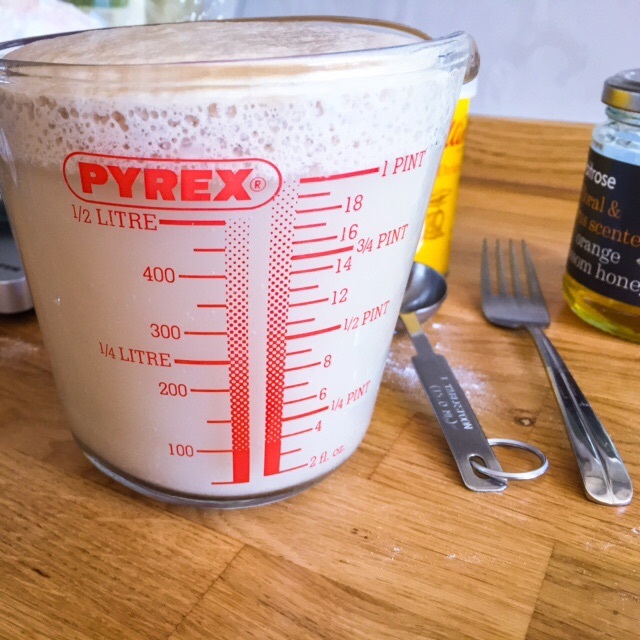 Leave the dough to rise for about an hour, until it has doubled in size. Depending on how warm it is where you kept it will depend on how long this can take, so don’t be afraid to cut this time short or extend it depending on your needs. 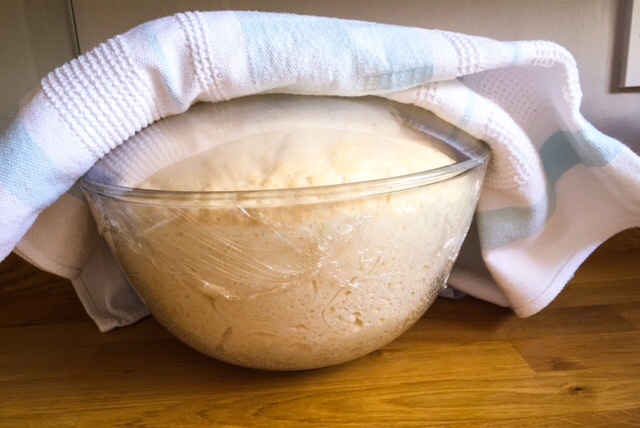 Once the first rise is complete, remove the cling film and/or towel and punch down the dough. You can now divide the dough and/or form your loaves. This is the stage where most adapted bread recipes will have you work on the dough to make something other than a basic loaf. Here you can use it as a pizza base or flat bread without the second rise, or you can add some additional fillings and roll it up to enhance your loaf! Assuming you are staying true to your basic loaf, carry on with the notes below. Place the formed loaves into a greased tin or tray. Cover again with a clean towel and allow to rise again for another hour. After the second rise, place your loaves in a preheated oven for 30 minutes. Check the bottom of the loaf and give it a tap. It should sound hollow. If it isn’t then give it another 5 minutes and check again. You can do this also by placing the loaf directly on the rack (out of the tin) which will result in a lovely crust. Remove the loaves from the oven and allow to cool for a couple of minutes in the tin, before removing to complete their cooling on a wire rack. These loaves freeze really well, so I usually freeze one loaf on the day (after it has fully cooled) and pull it out when we are nearing the end of the first loaf. However, I also find if I haven’t made bread for a while, then the first loaf is likely to not last much more than a day. Which means you need the second loaf at the ready!